For many people, Eureka is an “oasis” of civilization on the otherwise empty and lonely US Highway 50, which cuts across the width of Nevada. Also known as the “Loneliest Highway in America,” Eureka is one of the few towns with any sort of services and lodging available. As such, travelers heading down US Highway 50 will likely find themselves stopping in Eureka. And you know what – that’s a good thing! 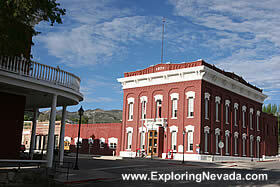 Eureka is one of the more historic towns in Nevada. Moreover, the town is clean and has a scenic location. Surrounded by mountains, Eureka’s location for outdoor pursuits – whether it be 4x4’ing, hiking or biking – is superb. Additionally, Eureka is a jumping off point for two of the more beautiful and remote scenic drives in Nevada, the Ruby Valley Scenic Drive and the Monitor Valley Scenic Drive. With an elevation of 6400 feet, Eureka has very cool weather by Nevada standards. Even during mid-summer, it’s very rare for temperatures to exceed 100 degrees. Usually summer weather consists of sunny days with highs in the 80’s and lows in the 40’s (the nights here are cold due to the high elevation). Eureka is not a large town, having a population of only 1050 people. However, at its peak during the 1880’s, Eureka had a population of over 10,000 people. But like other mining boom towns in Nevada, as the mines played out and became less labor intensive, the population shrank dramatically. As such, the area around Eureka is full of empty buildings, structures and forgotten ruins. Last time I was in Eureka, the town had three motels. The Best Western is by far the nicest one in town, although it’s also the most expensive. If the motels in town are out of the preferred price range, fear not, as primitive camping is available virtually everywhere outside of town. Additionally, there's plenty of primitive camping just outside of town on the BLM and National Forest lands.